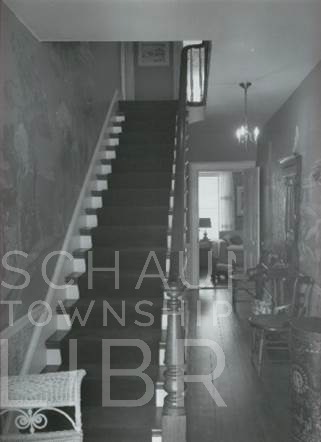 This is an interior photo of the Sunderlage House in Hoffman Estates taken in the mid-1950s. It showcases the warm, cozy interior of this beloved farmhouse when it was a private residence. If you look closely, though, your eye is also drawn to what look to be murals painted on the walls on either side of the staircase. This photo was donated to the library by Sandra Volid Bauer, the wife of Peter Volid. Mr. Volid owned the house when the photos were taken. He was not married to Sandra at the time, but he told her later about the murals on the wall. According to Mr. Volid, these murals were commissioned by Lila Harrell who bought the farm from descendants of the Sunderlage family in the 1930s and owned it until 1952 when Mr. Volid purchased it from her. 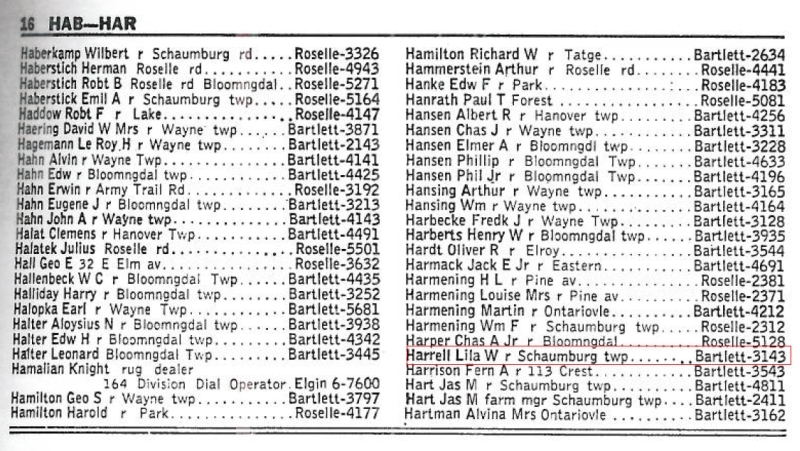 See the entry above from the 1949 Bartlett/Roselle Telephone Directory that shows her address and phone number. Ms. Harrell called her home and its surrounding acres “Angelus Farm.” She also modernized the house by putting in electricity and plumbing. One of her other touches was the murals that were painted on the walls. Given her involvement in that field, she must have been fairly familiar with the arts world in Chicago. At some point Ms. Harrell hired a Chicago-area artist by the name of Malvin Albright to paint the walls according to Sandra Volid Bauer. It isn’t known if Ms. Harrell specifically instructed him to design murals for the walls or whether that was his idea. What IS interesting is the artist. Malvin Albright was the twin brother of Ivan Albright, who has a special gallery for his works in the Art Institute of Chicago. 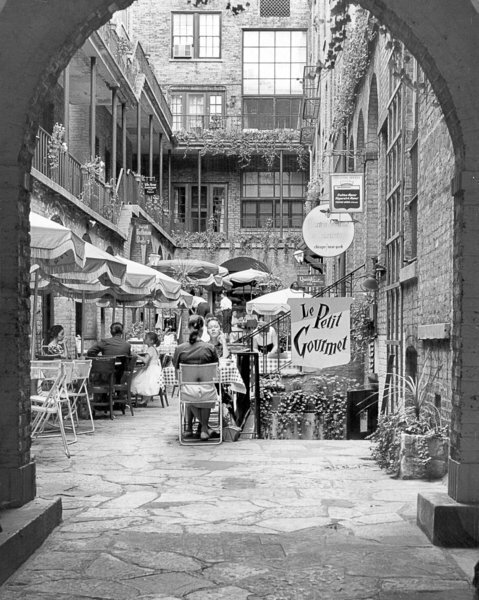 Ivan was known for his unusual style that was most noticeable in the painting featured at the end of the 1945 movie, “The Picture of Dorian Gray.” You can see it below. Malvin and Ivan grew up in Warrenville, IL where their father Adam Emory Albright, a painter himself, purchased an old Methodist church in 1924 to use as the Albright Gallery of Painting and Sculpture. While Adam was more of an impressionistic painter, his sons turned their sights to other styles. Malvin began his art career as a sculptor but eventually switched to painting with watercolor and oils, signing his work with the name “Zsissly.” According to his obituary in the Chicago Tribune of September 16, 1983, Malvin’s paintings were a lighter contrast to his brother’s darker style. Still, in looking at Malvin’s painting below you can get a glimpse of how their painting techniques were somewhat similar. Unfortunately, the mural that Malvin painted is not viewable today. In fact, Marilyn Lind said that when she first got a glimpse of the house back in the 1970s, the walls had already been painted over with a solid color. But, in scraping at it with her fingernail, she could tell that the paint that was used was quite thick and that the colors were pale blue, gray, pink and white–which was quite an interesting palette. 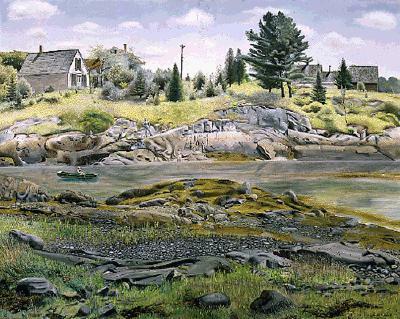 She could also see the outline of nature scenery, houses and people walking. 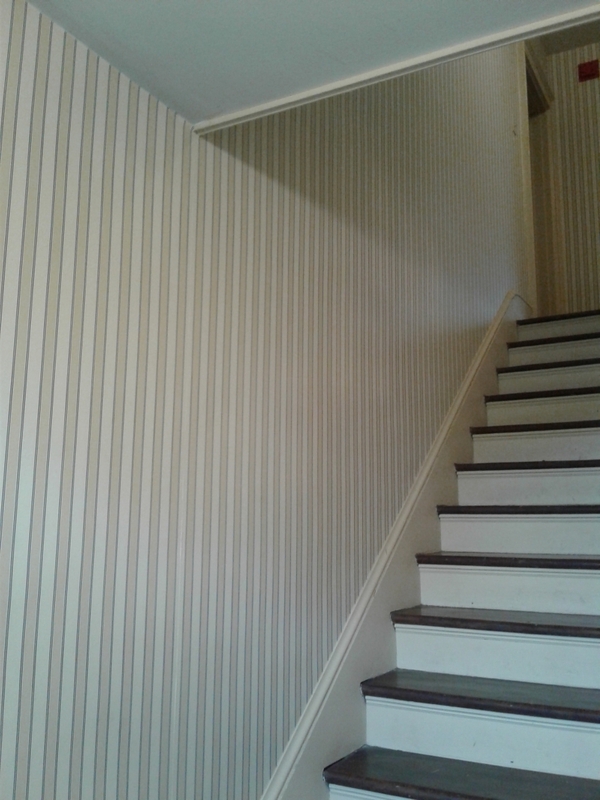 Today, wallpaper covers the staircase walls. It seems there are always surprising connections to be found in Schaumburg Township. The area may have been rural for many years, but it was still close enough to Chicago that it was touched by some very interesting people! You can take a look at the Sunderlage House for yourself. The next time the home will be open is for the Teddy Bear Holiday Party on December 1 at 1 p.m. More details can be found here. If you are interested in the Albrights, you might want to check out the Warrenville Historical Society. This entry was posted on November 11, 2018 at 7:00 am and is filed under Farms, Hoffman Estates. You can follow any responses to this entry through the RSS 2.0 feed. You can leave a response, or trackback from your own site.